I am bursting at the seams to show you this fantastic print "Tardis doctor who jump into time Vortex", by artist Three Second, on SOCIETY 6! 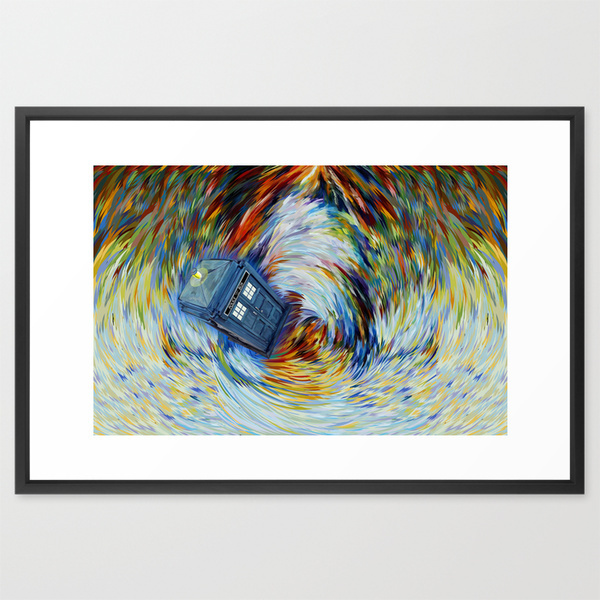 It is a wonderful artistic illustration of the blue police box, from Dr. Who, in a vortex of wonderful colors! The print is huge at 38"x 26" and is framed and covered and comes ready to hang for just $126, or less for smaller sizes! To give you an idea of how awesome this is, here it is, across the backs of two of my cosy chairs! It is just glorious, framed great and of such good quality that anyone who has set eyes on it since it came into my home has immediately admired it and asked where it came from! The great thing about Society 6 is that there are SO MANY artists and creations available to choose from, that there is plenty of choice for everyone's individual tastes and gifting pleasure and, as an artist myself, I can fully appreciate the time and effort that goes into each of these pieces and can tell you that the prices are fair and quality superb - just what I would expect and want for my prints, too! Wait! There is more! Not only can you buy art prints to hang, you can also buy prints on pillows, cups, leggings, bags and so much more to gift for any occasion! 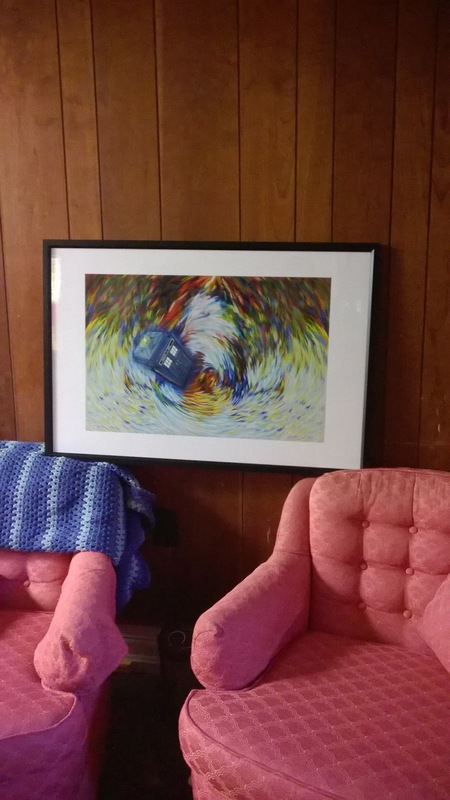 I love a good art print, though and was so thrilled to get to review this that I jumped right in and picked this up for my son, who just loves Dr. Who and will adore it! You can find prints like this one, and more, on society6.com and follow them on Twitter and Facebook, too, for the latest updates and new creations! What are you waiting for!? Head on over and see what gems you can find, now! Disclaimer: I was provided with this art print in order to review the quality of Society 6, and all opinions are my own. I was not otherwise monetarily compensated, and your views may differ to my own! Thank you! What a great print! I know someone who it would make the perfect Christmas gift for! Oh, that's such a nice print! So unique from what I usually see. I'll be adding that to my Christmas wish list. What a great print!! I'm not a Dr. Who fan but I would hang this in our home because it's so eye catching. It would really look great in any room! That really is a great and a very interesting print! I need something for one of my bedroom walls-I think I will go over to this site and see if something catches my eye. I know a Dr. Who fan in our extended family that would love this. She's about to graduate high school and move off to college - perfect for decorating a dorm room! These art prints are really nice and colorful. They are the perfect addition to any home.